The current way is pretty poor UX -- try it yourself, manually type something in the Memory Card Manager's path boxes and see what happens. If we want this feature, we should add an explicit 'create new file' button or dialog. Note that this is the only place where GCMemcard is ever instantiated without first checking if the file exists, so barring file system races it's the only place that can actually reach the 'create new file' branch. Thoughts? The actual new UI here is pretty slapdash, but I figured I should collect some opinions before actually putting effort into making a nice dialog. 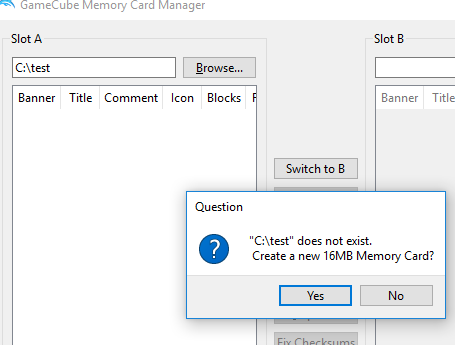 GCMemcard: Add constructor that creates a new memory card. It feels unintended, to be honest. What is currently in the PR is just a button that opens a regular file save dialog, but I'm not really sold on that. It'd be nicer to have a separate window where you could select things like encoding and card size. Anyway, if you want to create a proper prompt best to create a new QDialog with multiple QComboBoxes for options (in a separate file). UX is still a bit meh with GCMemCard directly showing alerts, but thats for another PR. 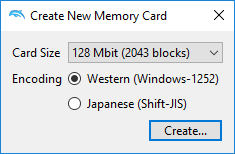 Regarding settings, I could see the "Create new" button being a dropdown that, when clicked directly, creates the default sized (which may or may not be the previous 16MB) western memcard; or when opened presents a list of common sizes that make sense. Not sure where to put that SJIS option tho; maybe a checkbox at the end of that dropdown? Yeah I noticed that too. I think I want to redesign the entire way this is constructed anyway due to the PanicAlerts so this will probably go away with that. 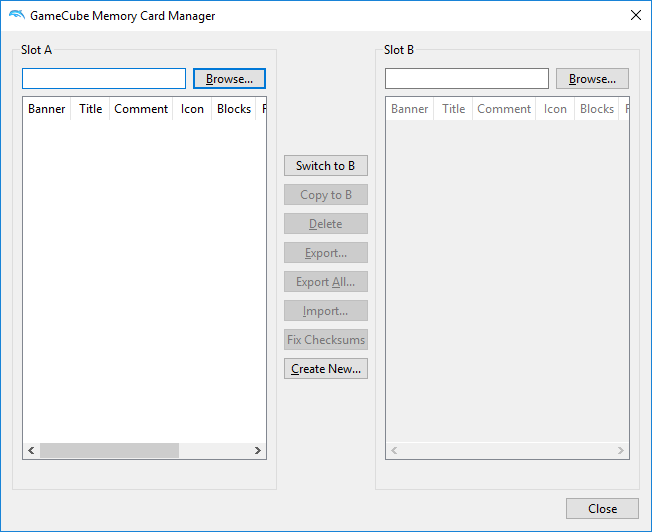 GCMemcardManager: Add GUI to create new memory card. I'm still not too happy about the actual placement of the button though, it doesn't really make sense next to the buttons that deal with the currently highlighted item in the save file list. Better ideas? Maybe two separate buttons around the Card A/B Browse buttons that then automatically select the newly created card for copying saves onto?